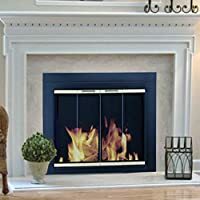 The Arrington Collection Fireplace Glass Door is a decorative bi-fold style door with a high heat powder coat finish which enhances a traditional masonry fireplace hearth. 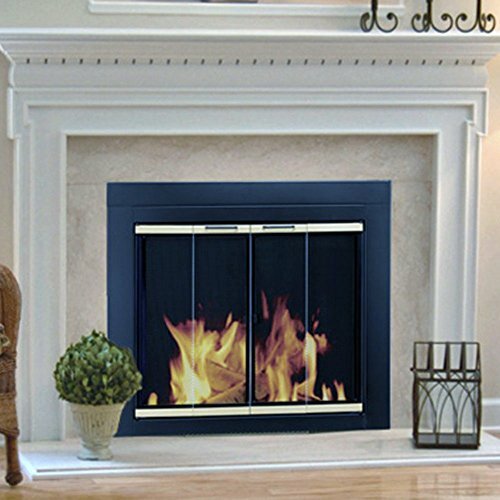 This one piece frame construction is designed as a surface mount and sits outside fireplace opening against flat surface. A Fireplace Glass Door assists in reducing heat loss or cool air loss up the chimney by as much as 90 percent. That equals a year round energy savings when fireplace is not in use. The Fireplace Glass Doors all come with easy grip handles, hidden damper control knobs for air flow control and heat resistant thick insulation. For masonry fireplaces only - not for prefabricated. Always keep mesh panels closed and glass doors open when fire is burning in fireplace. Before you buy, measure the front opening width and height to choose the correct size. Made in the U.S.A.